Report time: Friday, 12 APRIL. Check-in begins at 1700 hours. In-brief at 2100 hours. Conclusion: Academy concludes at approximately 1530 hours on Sunday. Lodging: Students will be lodged in Volk Field housing. Linens will be provided. Students will be slotted into the appropriate course based on qualifications at the time of application. If you do not have everything completed for a rating, then you will be slotted into that rating for the duration of the school. This means that if you are almost done with GTM3 and want to train for GTM2, you need to complete all your GTM3 training tasks prior to applying for the Ground Team Academy. Please do not submit an application unless you are ready to accept the slotting decision based on the information available at the time of submission. A separate track for qualification renewals is not available, but you are welcome to apply; you will be slotted into the applicable course to accomplish your renewal tasks. – IS100 and IS700. Certificates must be uploaded into eServices. – Full and complete 24 and 72 hour packs as outlined in Task O-0001 of the GT Task Guide. *Members without appropriate weather gear and/or safety gear may be restricted from training or asked to leave the activity. – Second year and more advanced students require first aid and ICUT completion. Qualified instructors and skills examiners will staff the Ground Team Academy. As always, there will be many opportunities to learn new skills and get tasks signed off, however we cannot guarantee that every skill will be covered or that every needed task will be signed off. Regardless, we strive to make sure that everyone who attends goes home with new knowledge gained, new acquaintances made and having participated in a fun and rewarding activity. Cost for the weekend is $50, which includes meals, billeting and supplies. The course start promptly Friday evening at 2100 with an informal (uniforms not necessary) in-brief – students will need to be checked in prior, beginning around 1700. Tentatively, we plan to conclude the academy around 1530 Sunday afternoon after facilities are cleaned and graduation/debrief is complete. Cadets are required to have an attending senior sponsor and hand-carry a completed CAPF 60-80 to the activity – further details will be provided upon course acceptance. 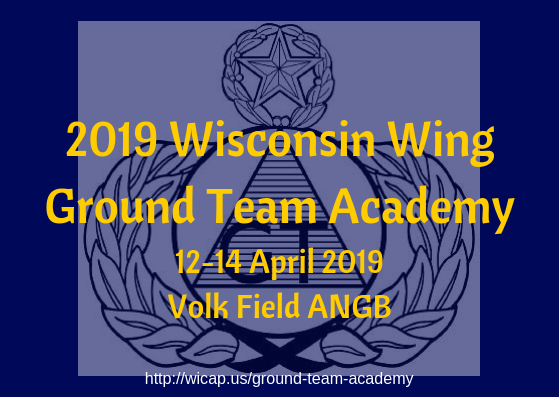 Members from other wings are welcome to attend however due to funding limitations mission travel reimbursement is limited to WIWG members only. Applications will be reviewed on a first come, first served basis. Prerequisites must be met before applying. No walk-in registrations will be accepted. Questions? Contact the Project Officer.